Buy the full cama seats if available, or the semi cama if you know the bus model. Ask ahead on where or when the stops are and time your liquid consumption accordingly. I managed to avoid using the bathroom on the bus for the entire trip by drinking water about an hour before each stop. Also let one of the bus attendants know when you get off the bus for a break, they could drive off without you. The bus will pick up passengers along the street AT NIGHT and they don’t have assigned seats, stow your valuables within reach and never above. 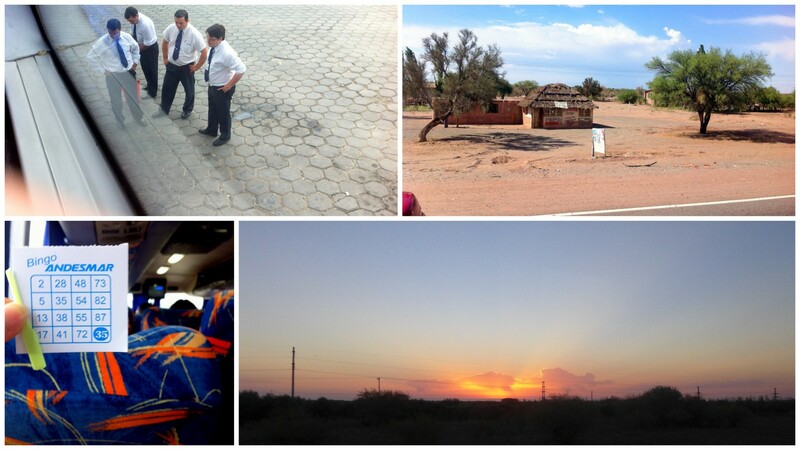 Top left: Bus driver and crew evaluating the condition of a tire… Top right: One of the many small towns we passed. Bottom left: They try to entertain you for the first hour, the last 16 hours you’re on your own. Once you begin to see fields of grapes, you’re close to Mendoza. And if you get as delirious as I was from the back aching bus ride, the field of grapes soon turned into overhead grapes at one of the cutest hostels in Mendoza, Hostel Empedrado. Maybe it’s the wine, maybe it’s the weather, or maybe it’s just the way this hostel do events, but I met the most travelers here than any other hostels. I have to admit, I am not a wine fan. They seem to taste all about the same to me and my palate can only tell two thing — I like it, or I don’t. Well, that was before Mendoza. Strange things happen when most of the wine nudges itself under the “I like” category. You have to really try to find bad wine here. And when so many wines are above good, differentiation comes naturally. I believe Mendoza expanded my palate with quality. The most do thing is to go on a wine tour. But not any wine tour, it must be a biking wine tour. All you need to do is take the bus into Maipu, find a bike rental, and they will give you a map with suggested route and wineries to visit. 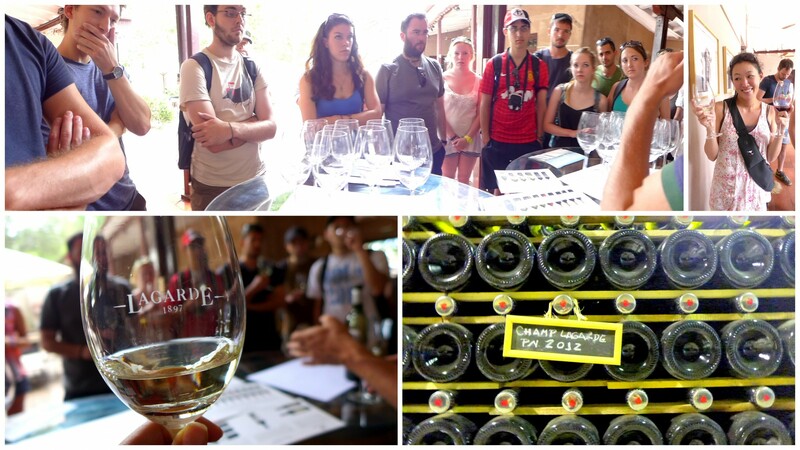 Depending on the number of persons in your group, the tasting at each winery varies from AR50-AR100 per person. You’ll likely be able to hit up 3-5 wineries at a leisurely pace. The pours are so generous it’s about half of what a normal “glass of wine” serving is from a restaurant. This translates to — drunk biking. So definitely don’t feel guilty to forfeit wines that you may not like that much, there will be many more to come. They also have wine tour on horse with fireside dinner prepared by gauchos, much like Salta, or you can find pretty good steak just about anywhere. I got nice bottles of wines from the grocery store. Yes definitely check out their wine selection at a supermarket, you can find high quality wine and brands for less than $10 USD. In fact, most of their decent/good wines run about $3 USD per bottle. The hostel also hold joint BBQ nights with other hostels. It was all you can eat, cook as requested. Must try: Torrentes wine. It’s similar to Canadian ice wine, slightly on the sweet and floral side, great as deseert. Wine tasting – AR$50 – A$100, with 5 – 10 samples. VERY generous pours.